You won’t mistake this fish for anything else. It grows to a length of 7 feet and tips the scales at over 300 pounds. The fish is brownish gray with dark spots when mature, but as a small juvenile (several inches) they are red-orange with distinct black spots. 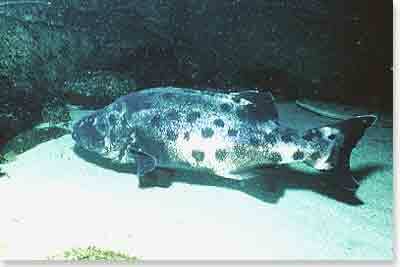 Their numbers have dropped due to over-fishing and are now classified as a protected species. They are usually found in deep water near the bottom and will move up and down the water column looking for food consisting of almost anything they can swallow. These fish live long lives, with aquarium specimens living over 75 years. They range from Humboldt Bay in northern California to the Sea of Cortez in Mexico. Photo courtesy of Tom Haight.